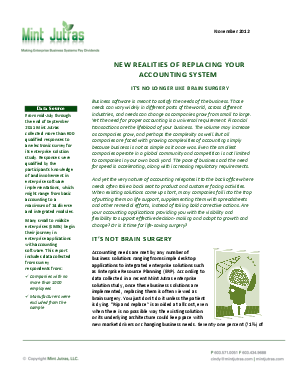 > Intacct > New Realities of Replacing Your Accounting System: It’s no longer like brain surgery. Business software is meant to satisfy the needs of the business. But when your existing software comes up short, why fall into the trap of putting it on life support—supplementing with spreadsheets and other remedial efforts—when it’s actually never been easier to upgrade to a better, more robust financial management system. Establish baseline metrics to justify the investment. Define the right selection criteria. Evaluate whether you need to consider mobile functionality or a cloud application.